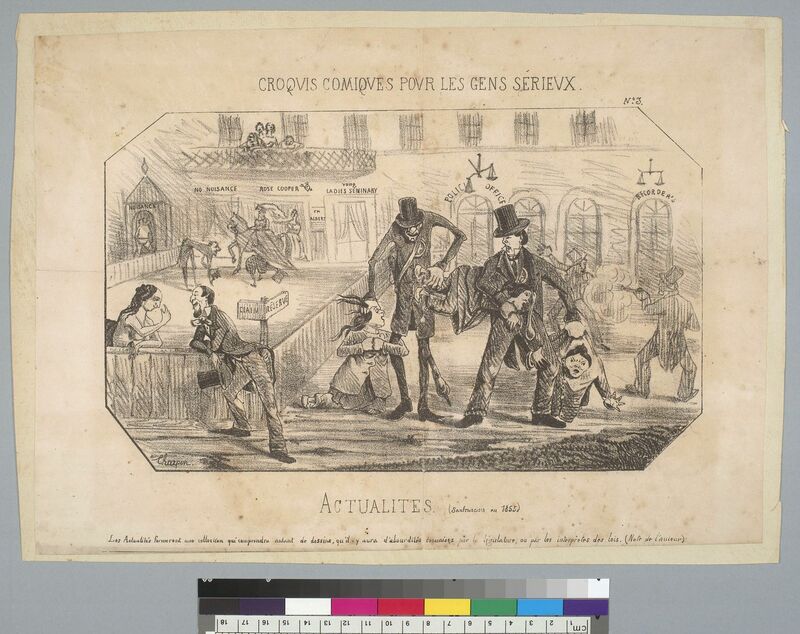 [UC]: Croquis comiques pour les gents sérieux [Comic sketches for serious people], [LC]: Actualités [News]; San Francisco [California] en 1855. Print on paper mounted on paper: lithograph 25.4 x 35.5 cm. California Pictorial Lettersheets from the Robert B. Honeyman, Jr. Collection of Early Californian and Western American Pictorial Material, BANC PIC 1963.002:0459—B, Courtesy of The Bancroft Library, University of California, Berkeley. Printed dialog caption (LC) stating that “Actualitiés” form a collection commenting on absurdities committed by legislature or by interpretations of law. Inscriptions in French.